The Woodbury Fire Department's newest firefighting tool was in display Tuesday night outside city hall. 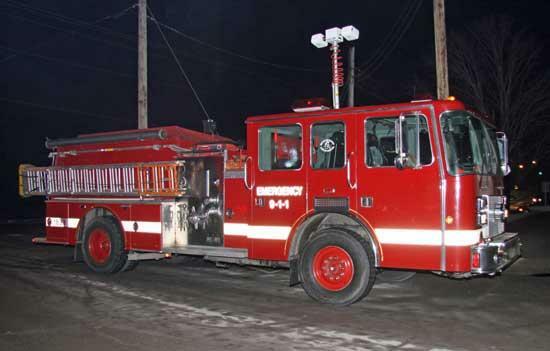 Woodbury's Board of Mayor and Aldermen received a report of an exciting addition to the Woodbury Fire Department Tuesday night during its regular monthly meeting. Fire Chief Bill Johnson told the council that the department traveled to New Jersey recently to pick up a used fire truck the department had purchased. Not only did the truck cost the town just $5,050, but it came with several add-ons that Johnson said he had not expected that pushed its value to over $10,000. • Approved a request for use of Dillon Park by Woodbury Pentecostal Church for an Easter Egg Hunt on April 3. • Approved a request for use of Dillon Park by the Cancer Society for the annual Relay for Life on May 31. • Approved a request by LaShonda Dillard (daughter of Tom and Jeanette Dillard for a roadblock fundraiser on March 13. LaShonda Dillard, a resident of Jonesboro, GA who grew up in Bradyville, will be using the funds to participate in the annual Susan G. Koman 3-Day for the Cure breast cancer awareness walk. The roadblock will take place on Main Street at the Tatum, College and Doolittle intersections. • Voted to form a committee to solicit designs and bids for a new signs for Brown-Spurlock Park. • Approved a resolution of agreement to provide matching funds for the Cannon County Fiscal Year 2010 Community Development Block Grant Application. Funds are currently available through the State of Tennessee CDBG Small Cities Program and Cannon County is applying for the grant to assist the Town of Woodbury in the extension of water lines to low and moderate income persons within the Lake Anne Road, Basham Ridge and Claude Gaither Road areas. A public hearing was held Jan. 20 to discuss the possibility of Cannon County applying for a Community Development Block Grant through the Tennessee Department of Economic and Community Development. The meeting was held in the office of County Executive Mike Gannon, and was attended by Amanda Mainord, Planner / Administrator for the Upper Cumberland Development District, and local resident Neal Applebaum. Gannon said the county will be applying for a grant to extend water lines. In order for the county to qualify for the grant, the area to which water lines would be extended has to be inhabited by at least 51 percent low-to-moderate income residents. Gannon said Basham Ridge Road, Lake Ann Road, a portion of Claude Gaither Road and Finnie Simmons Road are the areas being looked at for water line extension. "Several homeowners in that area have asked to have city water," Gannon said. If the grant is received and the water line extended to the area, the Town Of Woodbury could then provide water service to homes there. Cannon County does not have its own water system. The amount of the grant being applied for is $500,000, and Gannon said that amount would pay for approximately five miles of water lines. The entire project would serve 35 houses. Gannon estimates that 30 to 40 percent of the county does not have water line service. The Town of Woodbury will provide all necessary matching funds for their portion of the proposed project and upon completion will assume all responsibility for operation and maintenance of the water system.